Since the conjuncture that marked the reception of Althusser’s works, it has become clearer that the the initial Anglophone interpretation of Althusser involved considerable conceptual mistranslation, and his texts have since then been cursed by a reputation which powerfully precedes the reading. The controversy had been brewing since 1960, when Althusser began to publish the articles which would be collected in his book For Marx. It reached a fever pitch first in 1963, when Althusser was censured by the PCF for an essay called “On the Materialist Dialectic,” then again in 1965, when For Marx was published. Taken as a whole, the essays set out a thesis that the development of Karl Marx’s thought was characterized by a rupture that took place in the late 1840s between the early, humanist theory of alienation (“The Young Marx”) and the later scientific analysis of the capitalist mode of production (“The Mature Marx”). The resulting rupture, which Althusser called the “epistemological break,” is a thesis almost universally acknowledged as central to the reading of Marx, even if this acknowledgment takes the form of derision and dismissal. If you pick up nearly any serious book which aspires to present an interpretation of Marx’s writings, you are liable to find somewhere within it a position statement on Althusser: for or against. As these writings were translated into English they provoked not only widespread controversy, but also the proliferation of a school of “Althusserianism.” Anglophone readers looked across the channel at the simultaneous rise of the French theoretical trend of “structuralism” and took Althusser to be the foundation of a “structural Marxism.” This hybrid trend, believed both adherents and detractors, ultimately aspired to developing a comprehensive and deterministic theory of history and capitalist society. This perception was, it turns out, extraordinarily inaccurate. However, it nevertheless gave rise to fertile theoretical innovation in the English-speaking world. At the University of Birmingham’s Centre for Contemporary Cultural Studies, Jamaican-British theorist Stuart Hall would eventually draw on Althusser’s writings about the “conjuncture” to study the phenomenon of Thatcherism, and on his early writing about ideology to propose theories of culture, race, and identity. 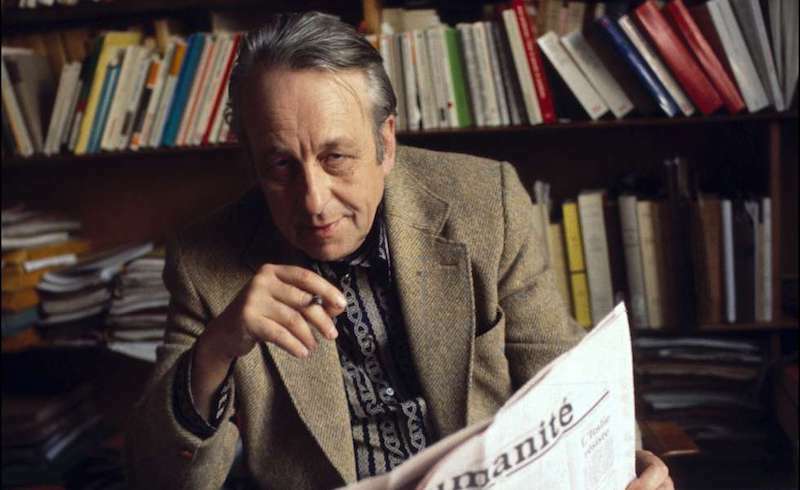 However, interpreting Althusser in terms of structuralism obscures the theoretical intervention he sought to make in the politics of the PCF, which made him so threatening to the party bureaucracy. Althusser was responding to his own conjuncture — the balance of forces and network of contradictions constituting a particular political situation. This conjuncture had emerged after Nikita Khrushchev’s 1956 speech condemning Stalin’s “personality cult.” The period of “de-Stalinization” which followed did not actually destroy the bureaucracies of the USSR or the western Communist parties. But it did lead to the abandonment of the revolutionary militancy left over from the anti-fascist resistance. For Althusser, an inadequate development of Marxist theory had left Marxists incapable of understanding and intervening in this conjuncture. It was a shortcoming which extended back to the Second International, oriented by the theoretical guru of the German Social Democratic Party, Karl Kautsky, and the founder of Russian Marxism Georgi Plekhanov. They advanced a form of “dialectical and historical materialism” that viewed history as an evolutionary process driven by technological development, which would ultimately result in socialism. In the postwar period, Marxists sought to go beyond this rigid, mechanical view of history, and they found resources in Marx’s youthful writings. Chief among them were the “1844 Manuscripts,” which had been published in 1932 and had gone largely unnoticed until now, when they were avidly taken up both by the Communist Parties and the heterodox left-wing tendencies that criticized them. In the PCF, this was represented in a dramatic extreme by the Party’s official philosopher Roger Garaudy. As William S. Lewis writes in Louis Althusser and the Tradtions of French Marxism, Garaudy’s project after 1956 was to show “how Marxism is not only a humanism but a theory of human liberation compatible with Judeo-Christian notions of emancipation,” and thus also a practical basis for uniting with Catholics and social democrats. Althusser, meanwhile, was plugging away at researching the conditions for the young Marx’s thought, ultimately aiming to investigate its relation to the more familiar later writings that had been used to justify the deterministic philosophy of the Second International. Althusser not only studied Marx’s primary texts, but also translated and commented on the work of Ludwig Feuerbach, which had had such a profound influence on the young Marx. In 1961, Althusser published an essay called “On the Young Marx,” reviewing a collection of eleven studies of the young Marx’s texts in Recherches Internationales. Here Althusser delivered his extraordinary and original analysis in depth. He rejected the view that Marx’s theoretical development could be explained in terms of his individual psychology, a personal project in which the seeds of his mature ideas were already contained in his youthful speculations. Instead, it was necessary to look to the ideological “problematic” that had framed Marx’s investigations. In using this term, Althusser did not only mean to suggest that Marx was a product of his time. It also meant that he had inherited a particular way of posing questions, defining terms, and organizing concepts. These may not have been consciously apparent in his writing, but nonetheless marked the limits of their scope, and were the starting point from which he had to begin his own theoretical journey. Viewed in this way, Marx’s earliest writings still belonged to a pre-existing problematic, and could not yet truly be described as “Marxist.” He had adapted Feuerbach’s critique of religion, which proposed that Christianity was an alienated expression of human nature and had to be inverted to reveal the material foundations of human “species-being.” Within this framework, Marx had simply substituted private property for Christianity and given human nature a foundation in labor. In order to generate a new, “Marxist” theory, Marx had to trace the terms of this already existing problematic back to its historical conditions: to English political economy, the history of the French revolution, and the uneven development of Germany which, Marx lamented, had led to an excess of philosophical speculation over historical progress. Marx was inevitably obliged to realize that Germany’s ideological overdevelopment was at the same time in fact an expression of her historical underdevelopment, and that therefore it was necessary to retreat from this ideological flight forwards in order to reach the things themselves, to touch real history and at last come face to face with the beings that haunted the mists of German consciousness. Althusser’s description of the new mode of thought Marx was in the process of developing as “scientific” did not mean reducing social life to a mechanical model; it meant that Marx engaged in a kind of scientific revolution. Like Galileo or Darwin, he retreated from myth to reality and achieved a form of discovery, the discovery of class struggle and the production of concepts to grasp it. In April 1961, a group of students, including Balibar and Macherey, approached Althusser at the ENS. They were involved in the student union of the French Communist Party, and had studied “On the Young Marx” with excitement, seeing it as an alternative to the then-dominant approach of Jean-Paul Sartre. When they asked Althusser to engage in collective study, he advised them to carefully read the works of the young Marx and return the next academic year. About ten to fifteen people gathered in the seminar, starting in fall of 1961, collaboratively thinking through these texts. It was followed with seminars on structuralism and psychoanalysis, including a talk by Althusser on Michel Foucault’s recently published History of Madness. Both Jacques Lacan and Jacques Derrida appeared to speak as guests in the seminar. And finally, in 1964, the group confronted the greatest challenge: reading Capital itself. In keeping with the seminar’s collaborative character, the research agenda was set by the students as well as by Althusser. The result was Reading Capital, published the same year as For Marx. It was the text which would elaborate on the nature of Marx’s scientific revolution. It achieved a widespread international readership in abridged form, with only the papers of Althusser and Balibar, and has recently become available in its entirety in English for the first time. Althusser’s own contributions to the seminar pointed out that after breaking with the previous problematic and producing new concepts like the mode of production, Marx never managed to produce a text that systematically demonstrated his new materialist method. It was most clearly on display in Capital, but only in the sense that it was actually put to use, rather than explained and described. The task for philosophers in reading Capital was to produce a philosophy for Marxism — to elaborate the materialism that could only be read between the lines of Capital itself. What could be found there was a view of history that broke with the determinism of the Second International, but also left behind the equally teleological humanism of the early Marx. Those writings had simply placed human nature at the origin and center of history, where Kautsky and Plekhanov had placed technological development. The task for Marxists in the latter half of the 20th century was to elaborate this other theory of history, the Marxist practice of philosophy, a task to which Althusser devoted the rest of his career. Today, Althusser is best known for a provisional excerpt, published in 1970, from the larger project On Reproduction: “Ideology and Ideological State Apparatuses.” As ever, his deployment of philosophy was an intervention in the political climate of the time. The PCF had set itself the goal in the late 60s and 70s of “democratizing” the capitalist state, and thus seeing its institutions as neutral shells. In contrast, Althusser set out the argument that even ordinary institutions constituted “ideological state apparatuses” (now fundamental enough to theory that they are often abbreviated as simply “ISAs”) that served to reproduce ruling class power. In spite of his influence on increasingly relevant theories of race and gender, the tendency in the past four decades is to skip over all the intervening years of Althusser’s biography to 1980, when the last and most disturbing episode of his life began. After undergoing surgery for a hiatal hernia, Althusser found himself unable to breathe while he ate and constantly vomiting, and entered into a suicidal delirium. He believed he had been sentenced to death by the Red Brigades, and told family friend and psychoanalyst Élisabeth Roudinesco, who presents a detailed first-hand account of Althusser’s life and work in Philosophy in Turbulent Times, that he was planning to set the ENS on fire. He attempted to gain an audience with the Pope, to advise him on the measures which had to be taken to avert the apocalypse. These were not, however, unfamiliar behaviors for Althusser, who spent his entire adult life suffering from “manic depression.” Today we would categorize it as a severe bipolar disorder, characterized by frequent psychotic episodes. He was regularly institutionalized, receiving drugs and electroconvulsive therapy. So it is often recounted that on the night of November 17, 1980, when he arrived at the home of the ENS doctor at the middle of the night shouting that he had strangled his wife, Hélène Rytman, the doctor assumed that this was another delusion. It was not. He had, in fact, strangled his wife, an act to which he repeatedly confessed while claiming to have been unaware of doing it. Three psychiatrists found him unfit to stand trial, recording that the strangulation had occured “in the course of [an] iatrogenic hallucinatory episode complicated by melancholic depression.” He was interned at the Sainte-Anne mental hospital, where his student Foucault had once done research on “madness” (and had been admitted himself during a suicidal depression decades before). Shifting then to the Eau Vive clinic at Soisy-sur-Seine, he would be in and out of hospitals for the rest of the decade. After an esophageal operation in 1987, he fell into another depressive episode and was institutionalized again. He would remain so until he died from a heart attack in 1990. Contemporary readers react to the story of Hélène Rytman with horror, quite correctly: it is horrifying. And it is a salutary development in our relation to the history of philosophical thought that the women who played fundamental roles behind the scenes — Rytman was central to Althusser’s political education, and remained an important influence on his work — are no longer marginalized and ignored. But the reactions which emerged after this incident in 1980, and have since been frequently repeated, tended to cynically exploit the death of Hélène Rytman as retroactive justification for dismissing Althusser’s positions in the controversies that he had already provoked two decades before, and for which he had already been subjected to a frantic and defensive scorn. Such mudslinging came from mainstream liberals like Mark Lilla, whose review of Althusser’s memoirs was called “Marx and Murder,” joining other commentators who used Althusser’s case to argue for the inextricable connection between Marxism and a violent death cult of the purge and the Gulag. But it also came from Marxists, some of whom now reproduced the biographical reading to which they had subjected Marx himself. They proceeded to draw a straight line between Althusser’s “anti-humanism” and the disturbing final chapter of his life to defend the superiority of their own interpretations. In short, Althusser's dismissal by the liberal mainstream had more to do with his political and intellectual work than any actual concern for Rytman. A lifelong communist militant and careful editor of Althusser's writings, she shared his theoretical and political views and could just as easily have become a target for those who took advantage of her death. In the instrumentalization of this tragedy to forward a political agenda, an unfortunate alliance formed between those who claimed that Marxism was a humanism and those who aimed to destroy Marxism altogether. They both profited, in this enterprise, not only from the pernicious stigma surrounding mental illness, but also from the concrete confinement of Althusser to the asylum. This was the very operation that Foucault, one of Althusser’s visitors during his hospitalization, had so exhaustively documented, the process by which exclusion and confinement produced the very categories of madness and reason. "In the midst of the serene world of mental illness," Foucault wrote in the 1961 preface to History of Madness, "modern man no longer communicates with the madman." During his 1982 institutionalization, Althusser began working on a new manuscript. These provisional notes would remain unseen until an excerpt was shaped into an essay by the editor François Matheron called “The Underground Current of the Materialism of the Encounter,” which was not published in English until 2006 in the Verso collection Philosophy of the Encounter. This text seriously destabilized the received interpretations of Althusser. Althusser’s “anti-humanism” had been shocking and troubling to many Anglophone readers. They assumed that in rejecting the young Marx’s account of the alienating experience of modernity, Althusser had sided with the emotionless bureaucracies of Stalinism, which had turned the critical philosophy of Marxism into the cold, oppressive science of dialectical materialism. Yet in the “Underground Current” Althusser proposed a theory of “aleatory materialism” — a materialism of randomness. He traced a subversive trend in the history of philosophy extending from Epicurus to Gilles Deleuze and Derrida, which advanced a materialism based not on the remorseless inevitability of a structure, but on the contingency of an encounter between two elements, like atoms falling in the void in the “clinamen” of Lucretius, which swerve to meet and create a world. He traced this current to Marx’s account, at the end of volume 1 of Capital, of the “so-called primitive accumulation” which brought about capitalist society. The orthodox, Second International interpretation saw capitalism as one stage in the succession of modes of production across history, driven by a linear and transhistorical development of the productive forces. But at the end of Capital, Marx proposes that capitalism results not from historical necessity but from a specific encounter between the “owners of money” and those who were dispossessed of everything but their labor power. This encounter “took hold” and elaborated tendential laws which reproduced the capitalist mode of production; but it is an encounter which could have not taken place, or indeed could have been fleeting, as Marx had suggested it was in Ancient Rome. For some readers, the discovery of this “late Althusser” gave the impression of an Althusserian break, a turning away from structuralism and science to a kind of poststructuralist mysticism. But since then, more archival materials from the late 1940s through the 1980s have been studied. With some distance from the theoretical conjuncture that marked the reception of Althusser’s works in the 1960s and 1970s, it has become clearer that the the initial Anglophone interpretation of Althusser involved considerable conceptual mistranslation, and his texts have since then been cursed by a reputation which so powerfully precedes the reading that it is rare for reading to happen at all. In E.P. Thompson’s Poverty of Theory, an unbalanced screed unworthy of the great British historian, Althusser’s supposed structuralist determinism was condemned as the ideology of a Stalinist bureaucracy, which sought to suppress the lived experience and subjectivity of workers. But the actual historical record, carefully documented by G.M. Goshgarian in his introductions to the posthumous Verso collections, shows that Althusser’s actual position within the PCF was one of constant antagonism towards the leadership, despite his conviction that it remained the only organization in which intellectuals could maintain close contact with the masses. Over the course of the 1970s, he came to more and more openly attack the tendency of the party bureaucracy to enter into the capitalist state and play by its rules. This, he said, led the PCF to direct its political activity towards reproducing its function within the state apparatuses rather than producing a “new practice of politics” which would have mass self-organization as its basis. For Althusser, Marxist revolutionary politics aimed at the possibility of a “non-state.” And while throughout the history of philosophy, since at least Plato, philosophers played the role of furnishing the state with an ideology that reproduced class rule, Marxist philosophy would have to be a “non-philosophy.” Just as the post-revolutionary transition would be one which facilitated the replacement of the apparatuses of the ruling class with a free association of workers, Marxist philosophy would replace the hegemony of intellectuals with the possibility of new modes of thought that created the conditions for a liberation of social practices. What appears to be a philosophical “turn” in the late Althusser, as Goshgarian argues, is actually an attempt to elaborate this non-philosophy. Warren Montag has shown in his Althusser and His Contemporaries that despite Althusser’s flirtation with the terminology of the dominant trends of French theory, Althusser was indeed never a “structuralist.” In retrospect, “structural Marxism” is a kind of imaginary projection which obscures the real intellectual history. In fact, Althusser should be understood as one of the most incisive commentators on the theoretical trends in the France of his period, during which phenomenology came to be displaced by structuralism. He also incarnates the possibility of a different relation between what have come to be warring camps in Anglophone radical philosophy: on the one side, an austere and empiricist Marxism, and on the other, the experimental avant-garde of Lacan, Foucault, Derrida, and Deleuze. The first camp sees the second as indulging in delirious, irresponsible, and unhinged theoretical excess; the second sees the first as outmoded and totalizing. Althusser, however, preceded this division. He was a convivial colleague of Lacan and Deleuze and a mentor of Foucault and Derrida. In his person, Althusser demonstrates that this binary opposition is neither the inevitable consequence of the theoretical history nor a foregone conclusion already contained in the texts. Early on he identified these non-Marxist contemporaries as “objective allies” in the struggle against idealism, pointing out that work that was Marxist by name might still fall prey to idealism and spiritualism if it did not confront the central challenge of constructing a materialist theory from the beginning. This project, suppressed in the Anglophone world for decades, illuminates the inescapable contradictions internal to Marxist theory. These contradictions, far from a source of weakness, are precisely what lend Marxism its critical character: because it attempts to grasp a historical process whose course it also seeks to alter. To ignore these contradictions, presenting Marxism as a complete and total doctrine, is to convert it into a philosophy of the state, which towers above the ensemble of social practices that constitute it. We can now begin to reread Althusser to cast light on this darkened episode in the history of Marxist philosophy, one which those participating in the contemporary revival of Marxism ignore at their own peril. Asad Haider is a founding editor of Viewpoint Magazine and author of Mistaken Identity.